Lee Bradbury hailed hat-trick hero Alfie Rutherford as he inspired the Hawks to a five-star showing against 10-man Maidstone. The Westleigh Park outfit romped to a 5-2 National League victory on Saturday. 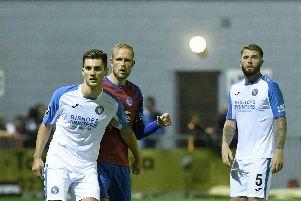 Rutherford netted a treble, while debutant Jonah Ayunga – who has signed on loan from Sutton – and Alex Bradley were also on target. Since being recalled from his loan spell at Eastbourne Borough, the Baffins striker has been in rampant form. He’s scored six goals in his past four games and his new strike partnership with Ayunga looks like it will be a potent force. It was a highly-professional performance from the Hawks, spearheaded by Rutherford's goals. Bradbury saluted the former Pompey youth player’s clinical finishing. And the Hawks boss insists it is further evidence that his team are finding their feet in the National League. ‘I thought we were really on it and fully deserved our win,' said Bradbury. ‘The players took on board the things we did in training and caused them a lot of problems. ‘First and foremost the energy we played with was fantastic. ‘I was impressed with how we started the game – aggressively and getting onto the front foot. ‘Alfie again showed what a thorn in the side he can be to opposition defences with his direct running and pace. ‘Some of the finishing was very clinical. ‘Going out on loan has worked wonders for Alfie. ‘Sometimes as a player you look at it as a negative thing but I told Alfie when he went it wasn't going to be a long-term thing. ‘Since coming back he has been a different player both physically and mentally. Ayunga was handed his Hawks debut, after arriving on a three-month loan from Sutton. Meanwhile, Alfie Pavey departed Westleigh Park for National League rivals Dover before kick-off on a permanent basis. The Hawks took charge from the start against Maidstone and were in front on 10 minutes. Ayunga, who was lively all afternoon, was blocked just outside the area as he was about to shoot. Rutherford latched onto the loose ball and his first-time shot looped into the roof of the net via a deflection. To make matters worse for the visitors, they had Elliott Romain sent off in the 33rd minute for violent conduct. Within a minute Ayunga punished the Stones further with a goal on his Hawks bow. In the second half Alex Bradley extended the hosts’ lead with a fantastic long-range strike. It looked all over when Rutherford drove in his second goal from beyond the far post to make it 4-0. Yet the Kent side caused a few jitters with two quick-fire goals in the final five minutes. Rutherford, however, had the final say when he raced clear and completed his hat-trick with a composed finish. The Hawks are now unbeaten in their past four games and are two points clear of the relegation zone. Bradbury has demanded his troops must not let their standards slip. The boss added: ‘I was disappointed we took our foot off the pedal and conceded the two late goals. ‘We are slowly turning Westleigh Park into a hard place for teams to come. Hawks: Dudzinski, Strugnell, Williams, Cordner, Woodford, Leeflang (Sekajja 59), Bradley, Stock, Lewis (Huggins 59), Ayunga (Kabamba 71), Rutherford.